"Why are we pretending the Holo John is a greenhouse?" The Holodeck on the Enterprise was always thought to be a truly marvelous piece of technology. Entrants could create and inhabit any world imaginable, moving to and fro as if they were actually there. 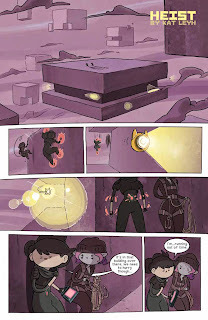 There was an elegance to the design of the chamber that's nowhere to be found in Bravest Warriors: Tales from the Holo-John from KaBOOM! Studios. 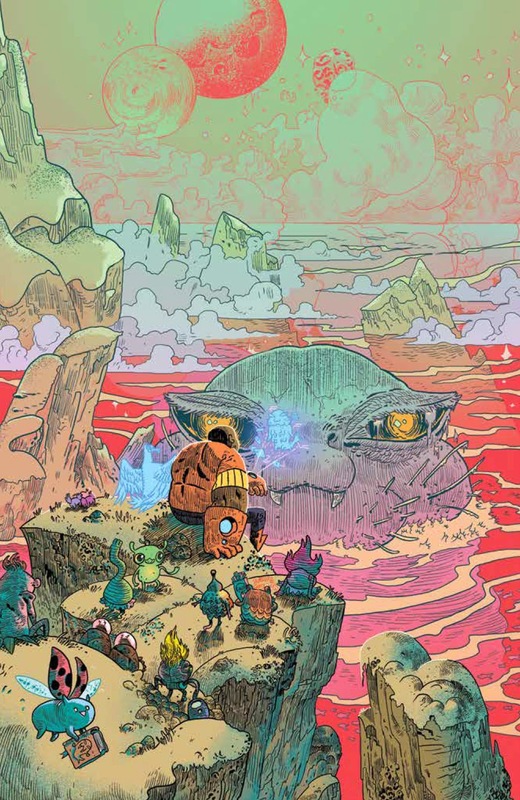 The one-shot is a collection of tales tied to the mysterious Holo John. 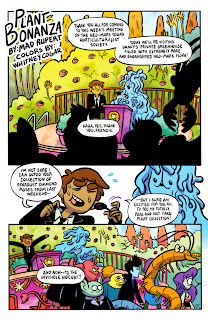 "Mr. Tickle's" is written by John Omohundro, illustrated by Eryk Donovan, colored by Whitney Cogar and lettered by Corey Breen. "Heist" is written and illustrated by Kat Leyh. "Do Holo Johns Dream of Electric Pee" is written by Ryan Ferrier, illustrated by Jorge Corona, colored by Jeremy Lawson and lettered by Breen. 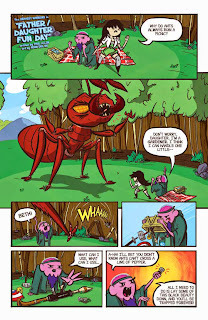 "Father/Daughter Fun Day" is written by Paul Allor and illustrated by Adam Del Re. 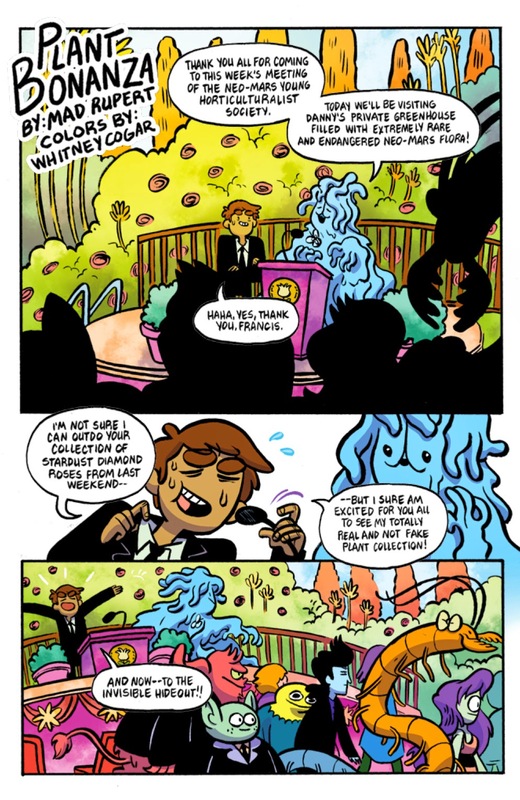 "Plant Bonanza" is written and illustrated by Mad Rupert and colored by Cogar. Bravest Warriors: Tales from the Holo-John is an anthology one-shot, filled with stories about the Holo John that border on the brink of inane. 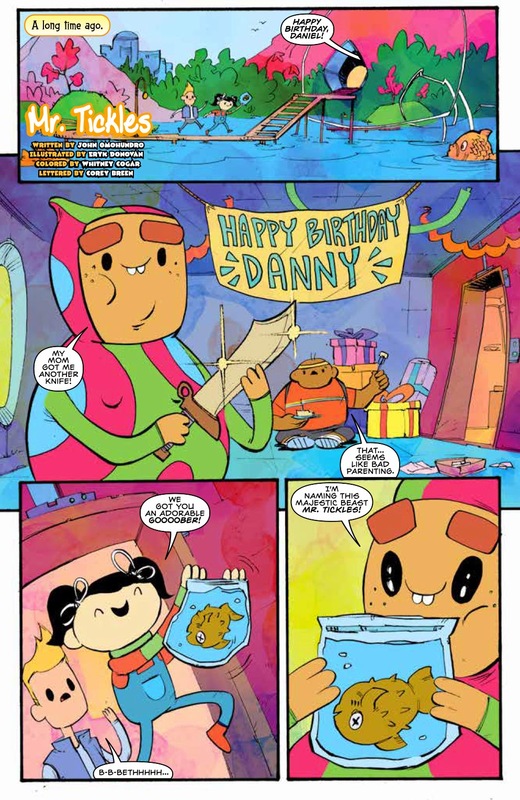 Fans of Bravest Warriors will feel right at home in the book, as all the writers maintain the same irreverent tone that fans of the show have come to expect. Each story is loosely tied together by the aforementioned Holo John and gives many of the characters in the universe a chance to experience the madness that is the Holo John. All of the writers do a good job of maintaining a consistently humorous tone throughout the issue, even as the stories span multiple characters. 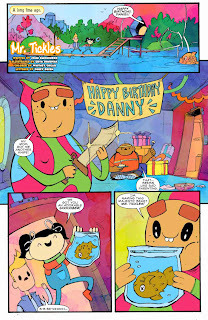 All of the work by Pendleton Ward has a certain aesthetic about it and the artists in Bravest Warriors: Tales from the Holo-John ensure that look is maintained in the book. Each of the characters are illustrated with looks that are easily recognizable to readers and fans alike. There's a relatively simplistic appearance shared by all characters that speaks to the look of the cartoon itself, which helps the books tone immensely. There's little attention paid to details such as facial expressions and physiques, but Bravest Warriors: Tales from the Holo-John certainly doesn't suffer for that omission. What's more is that the look of the book promises the reader that the anthology isn't to be taken too seriously and instead should be enjoyed simply for its insanity. 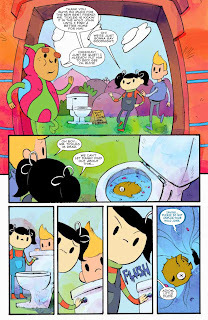 Bravest Warriors: Tales from the Holo-John knows what it is, knows what it wants to be and knows what it needs to do in order to maintain its identity. The collection of short stories in the one-shot tap into the overarching zaniness of the property well and leave little stones unturned in the way of offering up off-the-wall scenarios for the characters to encounter in the Holo John. 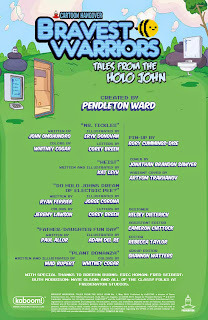 The writers maintain said Holo John as an anchor for all of the stories, relating their tales to the illusions propagated by the bathroom fixture. The book looks like a cartoon as well, with easily recognizable characters and page layouts that are largely in a grid, yet broken up here and there by more ambitious (and creative) layouts. 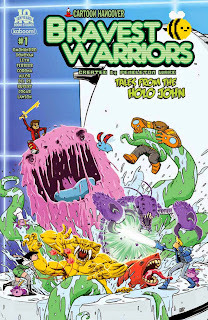 Bravest Warriors: Tales from the Holo-John will appeal to fans of the property and might even be enough of a collection to get new fans hooked on the madness that is Bravest Warriors. 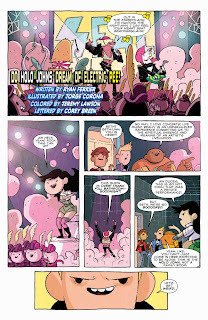 Bravest Warriors: Tales from the Holo-John oversized one-shot is in stores now with interiors below.